The United States is a hierarchical country where the weak ones are at the bottom and the powerful ones are at the top. Garment workers are at the bottom of the list although they are the most important. Without them there would be no fashion industry. They sew and cut the garments that people buy, the raiment that models wear on the runways. After the garments are sewn, factory owners send the garments to contractors to get make the clothing. Contractors make sure the garment workers sew the garments properly. Once the garments are done, factory owners send the clothing to brands so they could advertise the clothing and send it to retail stores. At last, the retail stores make billions of dollars in clothing while the garment workers only got paid about $8/hr to make the clothing. It doesn't seem fair. Garment workers do the hardest work yet they get paid the least. Most garment workers work in unsafe conditions, places filled with air pollution. Garment workers should not be taken for granted; they should be treated with respect and kept in a safe environment that will not affect their health. Garment workers did not always exist. It all began during the Industrial Revolution. The Industrial Revolution marked the era of exploitation. As machinery such as automobiles and sewing machines were built, life was made easier but it also created more ways for people to get exploited. For example, Federick Taylor analyzed every job in the mill and worked out a system to increase profits and production. This was known as Taylorism. Taylorism was beneficial for companies because people could do the work even though they were not experienced. One person would do the same movement over and over such as screwing a piece of metal to a car. The best part about this system is that anybody was replaceable because anyone could learn to do the same job really easily. As the Industrial Revolution grew, so did the companies. By 1905, there were 5 garment factories in New York. (Quote). Hence, the sweatshops were born. In the winter of 1909, women organized a strike at the Triangle Shirtwaist Company. Thousands joined the ILGWU everyday, including colored woman. In more than 300 shops, workers won their demands. There was a fire at the Triangle Shirtwaist Company on March 25, 1911. The fire happened in the 8th, 9th, and 10th floors but the NYFD did not have ladders that could reach that high. The laws said that the doors were supposed open outward but in the shirtwaist Company the doors opened inward. The laws also said the doors should not be locked during working hours but at the Triangle Shirtwaist Company the doors were usually locked. Trapped, the young women, and a few men were burned alive. 146 women died. There was a memorial parade down Broadway and 100,000 people marched. "Garment workers are an important part of the economy. In 2001, spending by 120, 255 workers in the apparel and textile industries created another 130,000 "indirect" jobs in Los Angeles County" (GWC 2). Although they help build the economy, garment workers go unnoticed most of the time. "Apparel in California is a $24.3 billion industry, with Los Angeles as the capital of garment production in the United States" (GWC 3). 80% of California's garment employment takes place in Los Angeles. "[The] U.S. Department of Labor survey concluded that two out of every three garment shops in Southern California did not comply with Federal minimum wage and overtime laws" (GWC 3). Three out of four garment shops are supposed to are unregistered. "two out of every three garment shops in Southern California did not comply with Federal minimum wage and overtime laws" (U.S. DOL). So what do these numbers mean? They mean that something is wrong. The laws need to be enforced but before we can enforce them, the garment workers need to be made aware that they have rights. The laws are not being followed for safety but another big issue is indoor air pollution. The reasons many garment workers do not fight back is because they are scared they might get deported because many of them are immigrants. The new strategy factories are using is taking their buildings to other places. Companies in the U.S. are built in other countries where the laws are barely enforced and they get people from that country to work for them. This is a big issue because it creates really bad pollution. That is why places like El Salvador and Mexico are so intoxicated with pollution. So what can we do about all the exploitation outside and inside the U.S.? Times have without a doubt has changed a little but there is always room for improvement. The issues of pollution and exploitation continue. We can start by making people aware of what is going on. We can make them aware that they do have rights and they also have a voice. We can sit down and listen to the stories of those who have been exploited, those who have been mute by fear. We need to listen to his or her stories, listen to what they have to say, which is what nobody does. Factory Girls: From Village to City in a Changing China. 1st ed. New York: Spiegel & Grau, 2008. Print. Crisis or Opportunity? The Future of Los Angeles' Garment Workers, the Apparel Industry and the Local Economy Crisis. Rep. Garment Worker Center. Web. 21 Jan. 2010. 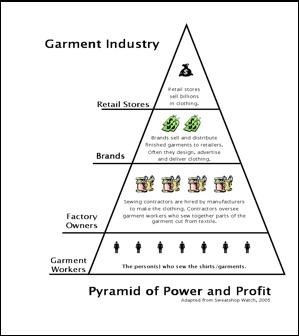 <http://www.garmentworkercenter.org/media/1/2004_Garment_Industry_Report.pdf>. Weblog post. Profile: Cause of increased air pollution around Los Angeles on weekends. NPR, 26 Dec. 2000. Web. 21 Jan. 2010. <http://infotrac.galegroup.com/k12/infomark/360/531/55478397w16/purl=rc2_K12J_1_(air+pollution+los+angeles)+and+ac+fulltext+_xx________________________________________________________________________________________&dyn=8!sg_df_air+pollution+los+angeles_xx________________________________________________________________________________________?sw_aep=lapl>. Jacques, Leslie. "China's pollution nightmare is now everyone's pollution nightmare." The Christian Science Monitor. Christian Science Publishing Society, 26 Dec. 2000. Web. 21 Jan. 2010. <http://infotrac.galegroup.com/k12/infomark/361/531/55478397w16/purl=rc1_K12J_0_CJ176841221&dyn=4!xrn_7_0_CJ176841221?sw_aep=lapl>. EPA proposes nation's strictest smog limits ever. Los Angeles Times, 8 Jan. 2010. Web. 21 Jan. 2010. <http://articles.latimes.com/2010/jan/08/nation/la-na-epa-smog-rules8-2010jan08>.